Banana peppers, also known as Hungarian, banana chili and yellow wax, are South American natives, come in hot and mild varieties, with hotter cultivars comparable to jalapenos. Banana peppers thrive in Florida’s warm, tropical climate. In the warmer regions of the state, where frost is unusual, they act as perennials. Gardeners can grow their pepper plants directly in the garden or inside containers. Their hardy and prolific nature make them good plants for the novice gardener. 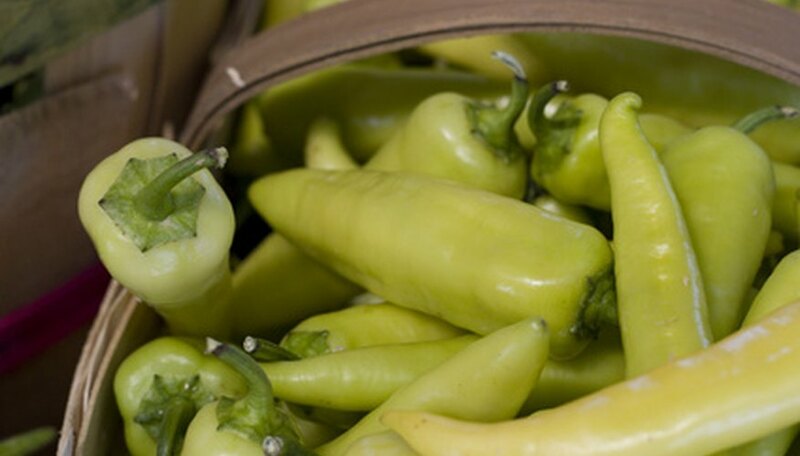 Plant the banana peppers outdoors when the night temperatures do not drop lower than 55 degrees Fahrenheit. Pepper plants are cold sensitive and will not do well in cooler temperatures. Select a planting site that receives full sunlight during the day and has good drainage. If your average daily temperature is around 100 degrees Fahrenheit, plant the peppers in an area that receives partial shade during the afternoon hours, so the plants do not burn. Remove any weeds or grass growing in the planting site. Keep an area of approximately 2 feet in diameter weed-free while the pepper plant is growing. If herbicides are used to kill the vegetation, wait one week for the poison to wash from the area before placing the plants in the ground. Amend the planting site with compost or peat moss, working it into the soil to a depth of approximately six inches. Banana peppers prefer growing in a rich soil that is light and airy. Dig a hole two times larger than the banana pepper’s root ball, but no deeper than the pepper is presently growing. Place the pepper into the hole and pack the soil around it. Space multiple banana pepper plants 18 to 24 inches apart, allowing enough room between them for air circulation. This will cut down on the chance of fungus and mildew forming on the plants. Add a 2-inch layer of mulch around the base of the pepper plant to help retain the soil’s moisture and cut down on weed growth. Water the pepper plant well after planting, being sure the water reaches the root system. Continue watering regularly to keep the planting site moist, but not flooded. Fertilize the banana pepper with a fertilizer that has a high middle number, which is the phosphorus amount in the fertilizer. Use a water-soluble fertilizer such as a bloom booster to help the plant form blossoms and then the banana peppers. Harvest your peppers by cutting them from the stems. Do not pull them off, as this is likely to damage the plant. Banana pepper plants can reach a height of 18 to 35 inches. Peppers can be harvested in approximately 90 days, depending on the cultivar. Tobacco users should always wash their hands before touching the pepper plant, as they can spread tobacco mosaic disease to the plant.